VdB 30 is a reflection nebula, visible in the constellation Camelopardalis. It is a very extensive gas cloud, but is hardly observable due to the low amount of light reflected and its relatively low temperature. 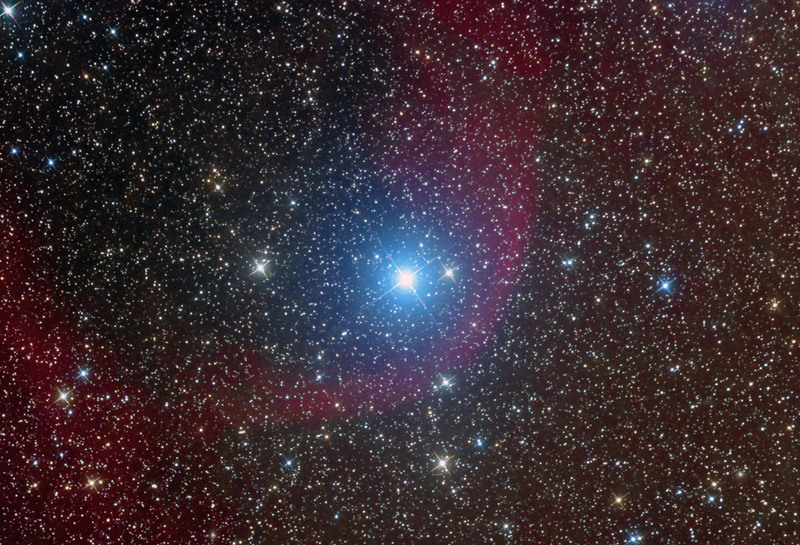 It appears to surround the star α Camelopardalis (in the centre of the image), a blue supergiant from apparent magnitude 4.26 and spectral class O9Ia. The cloud extends for about 29 parsecs and is composed of cold dust, which emit infrared radiation due to the weak heating received from the supergiant, whose emissions, because of its surface temperature equal to 30,000 Kelvin, are especially ultraviolet. The nebula has a ring shape, impressed by the strong stellar wind of the supergiant, which is also responsible for creating a bubble in the interstellar medium surrounding, thus dispersing the cloud itself. The distance is estimated to be more than 6900 light-years.